Patio furniture covers can help increase the lifespan of your patio furniture by protecting from sun, rain, snow and ice when not in use. Taking simple steps by covering your furniture will save you money further down the road since you won't need to replace neglected furniture that was left to fend off the elements. Purchase patio furniture covers at a local store or choose one of these retailers who offer quality covers at a relatively cheap cost. The covers featured on The Cover Store website are advertised as being "factory direct pricing" and the "best protective patio furniture cover warranties in the industry." 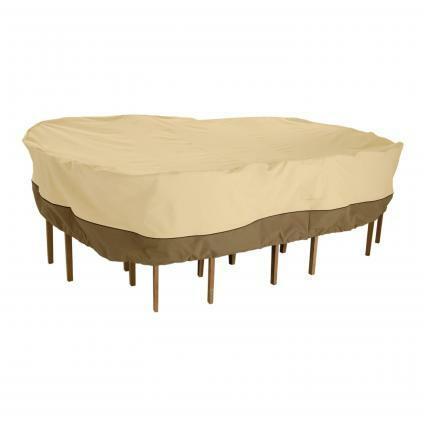 The company claims to have the largest assortment of sizes and style on the Internet and they truly have a large and varied assortment of patio furniture covers. The company has a 30-day "no questions asked" return policy. The covers are made of 3-ply fabric with the middle layer made from waterproof material. Customers have four grades of fabric to choose: Select, Elite, Classic and Ultima. The Cover Store Customer Reviews: Customers give high ratings. Comments include surprise over how thick the covers are, yet lightweight. Quality is good and covers fit patio furniture snuggly. Cozy Days offers soft vinyl covers that are made out of extra thick commercial-grade fabric with injected fleece backing. The covers feature a Velcro fastening system to secure over furniture. Cozy Days Customer Reviews: Customers are very enthusiastic and positive about the covers' durability, look and ability to remain in place even during high winds. Many customers remark they are repeat customers. Covers are available in tan color. 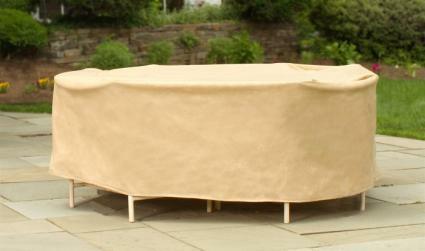 Each category offers a wide range of cover sizes to ensure you find one that will work for your patio furniture style. Resort Chaise Towel cover: $9.00 white or beige colors. This company also offers Duck covers that are inflatable to keep furniture clean. Covers have secure tie downs. Covers are made out of a triple-layered, waterproof, breathable and UV treated synthetic material. Every Duck Cover order comes with a Duck Covers Rechargeable air pump. Amazon Customer Reviews: Several hundred reviews give this cover a high overall rating. Customers comment they are pleased with the fit and protection. Sure Fit patio furniture covers can be ordered online through Walmart for site-to-store delivery, where you then pick up your order. Covers are made from 380-gram strong polyester material with a PVC-coating for water resistance. 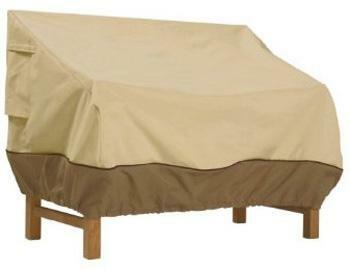 Walmart Customer Reviews: Customers like the way the covers fit snuggly over the furniture and repel water. When browsing covers for your patio furniture, you want to pay close attention to the descriptions to determine if the fabric will hold up under the harsh UV of the sun. Fabric that isn't treated to have UV protection will not protect your furniture from UV rays. You also want covers that will repel water or at the least to be water resistant. Otherwise, your furniture will get wet and the cover fabric could mildew and rot. Find some great buys that will protect your furniture for several years.